Taken on Christmas Eve of 2009, this image shows the lower 45 kilometers of the Tsauchab River, a famous landmark for Namibians, tourists, and for orbiting astronauts. 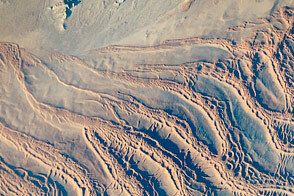 The Tsauchab River bed is seen jutting into the sea of red dunes near Namibia’s hyper-arid coast. The riverbed ends in a series of light-colored, silty mud holes on the dry lake floor, known locally as Sossus Vlei (“small lake”). Because of the present arid climate, few people have ever seen the Tsauchab River with flowing water or a lake in Sossus Vlei. In times past, however, the Tsauchab appears to have reached the Atlantic coast, another 55 kilometers farther west. Like several other rivers of the coastal Namib Desert, the Tsauchab brings sediment down from the hinterland to the coastal lowland. This sediment is then blown from the river beds, and over probably tens of millions of years, has accumulated as the red dunes of the impressive Namib Sand Sea. 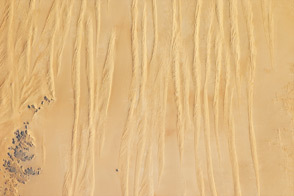 This astronaut photo shows sand heaped up in numerous star dunes, each of them with long arms extending in several directions. Unlike crescent-shaped barchan dunes, which form in areas where winds generally blow from one direction, star dunes are apparently generated where winds are variable. In this part of the Namib Sand Sea, winds are mainly from the south, but easterly winds, channeled along the Tsauchab valley, provide another component. And warm dry winter winds—similar to the Santa Ana winds of California—blow from the northeast. These northeasterly winds are likely responsible for the regular dune arms that point into the valley from both sides. These large dunes facing the river valley are promoted as the highest dunes in the world. Although continuous dune slopes allow hikers to ascend to altitudes more than 300 meters above the river bottom, not all of that elevation gain has to be walked; the main base of the dunes lies on a terrace 180 meters above the river. Astronaut photograph ISS022-E-15154 was acquired on December 24, 2009, with a Nikon D2Xs digital camera fitted with an 180 mm lens, and is provided by the ISS Crew Earth Observations experiment and Image Science & Analysis Laboratory, Johnson Space Center. The image was taken by the Expedition 22 crew. The image in this article has been cropped and enhanced to improve contrast. Lens artifacts have been removed. The International Space Station Program supports the laboratory to help astronauts take pictures of Earth that will be of the greatest value to scientists and the public, and to make those images freely available on the Internet. Additional images taken by astronauts and cosmonauts can be viewed at the NASA/JSC Gateway to Astronaut Photography of Earth. Caption by M. Justin Wilkinson, NASA-JSC. 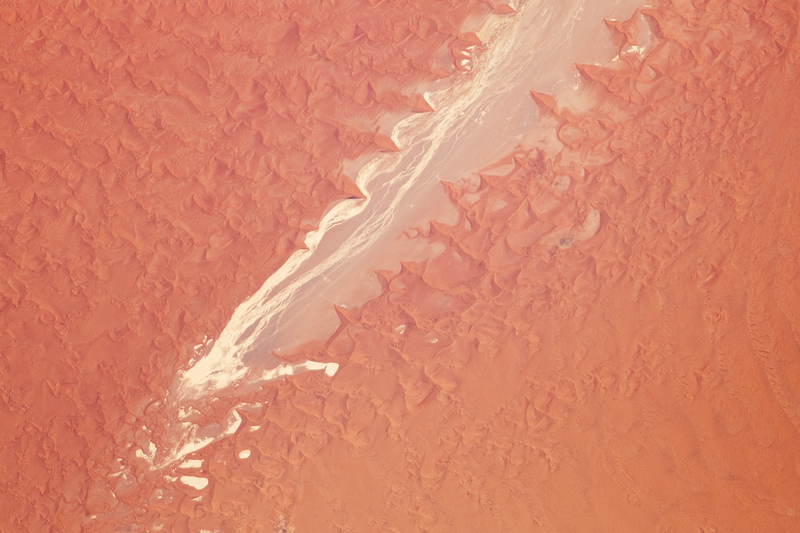 A pale, dry riverbed cuts through the red dunes of the Namib Sand Sea.